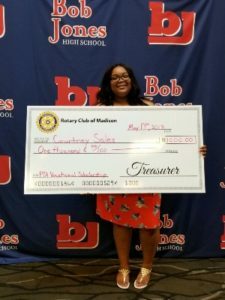 Congratulations to Courtney Sales from Bob Jones High School for receiving our 2018 Vocational Scholarship Award. 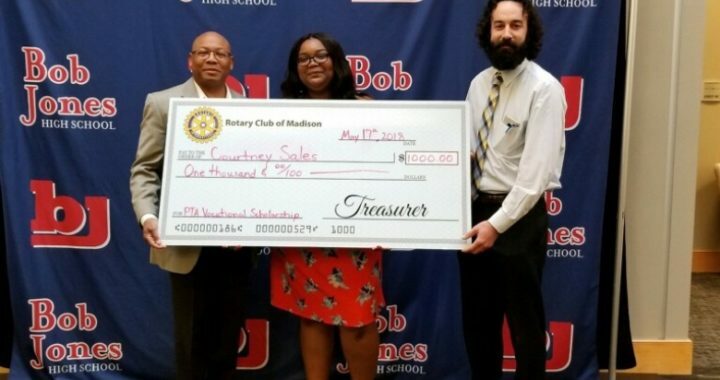 The scholarship is awarded to one graduating senior each from Bob Jones and James Clemens High Schools, and is co-sponsored by the Madison Street Festival. The application is limited to students who plan to attend a vocational or technical school with a minimum GPA of 2.0. Courtney will be attending Calhoun Community College to pursue a Physical Therapist Assistant degree. Pictured above with Courtney is incoming Rotary Vocational Director, Stephen Shaw (l.) and Chris Cornelius from the Madison City PTA.